Parking: For closest access to the playground area, you can park along Park Ave or along Cherokee Ave in the parallel spots. There are also three parking lots (one on Boulevard south of the playground, one on Cherokee south of the playground, and one on Park and Sydney inside the park). Features: Separate toddler area includes a bridge, two smaller slides, car race wall, and two noise makers. 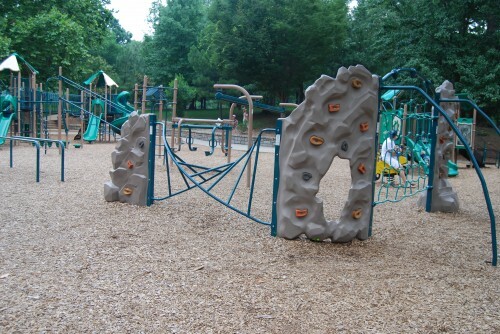 The large playground structure features a curvey slide, a very tall slide, and several medium slides, a couple of rock walls, a vertical climbing structure, and pendulum climbing posts. Swings on the playground include a tire swing, two baby swings, and two big kid swings.Two motorcycle bouncers. More swings (two baby swings and two big kid swings) are located at the bottom of the hill toward Cherokee Ave. Surrounding Park Area: Grant Park is one of Atlanta’s largest greenspaces. Multiple sidewalk trails within the park. Toward the north side of the park boasts a City of Atlanta recreation center, three tennis courts, two basketball courts, a baseball diamond, and an (unofficial) dog park. Directly east of the playground is a city of Atlanta pool (which includes a zero entry kid pool and splashpad). Heading south toward Atlanta, the zoo is the main attraction (which also has two playgrounds inside the grounds), along with two large pavillions and a large fountain (no swimming or fishing allowed). Toward the southeast side on Boulevard is another (less maintained) playground, as well as Fort Walker, an old civil war fort. Shade: The perimeter of the playground has some very nice trees that give you shade. Some of the play structures have small amounts of shade. Seating: Two benches. There is a large wall that you can sit on as well that gives you good visual access to your children while playing. Stroller/Wheelchair Access: Very accessible. All trails within the park are sidewalk. There are no stairs leading to the playground area. Depending on where you park, you may have to jump a curb with a stroller. Safety: Multiple kids with their parents at all times of the day. There is a police station on the southwest corner of Grant Park (at Atlanta Ave and Cherokee Ave), and often there is a police officer on bike patrolling the park or even better, a police officer on horse! Overall Assessment: This is a great playground. There are always kids and families at the playground; you never feel alone. The added bonus of having this playground within Grant Park is that it lends to nature walks and people/dog watching. The city keeps this playground nice, with new mulch added at least twice a year. Grant Park Conservancy also helps with the upkeep of the playground and the greenery surrounding the perimeter of the playground. Several trashcans around the playground help keep the playground clutter and trash free. Finally, street noise is minimal since the playground is inside the park and not on any busy street.